Best Visual Artist Runner Up 2012 by the Readers of the Hippo & portraits of selected winners! Holy Cow! For the third year straight I've won an award from the Hippo's "Best Of" reader poll. 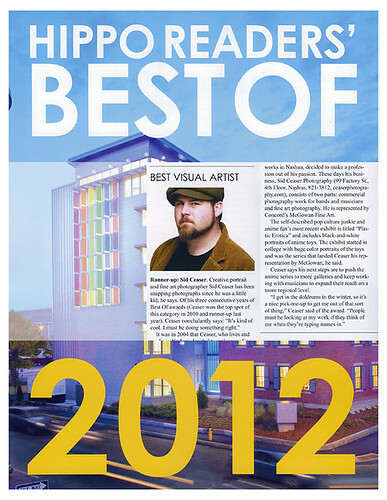 This year I was voted "Best Visual Artist - Runner Up" by the readers! Thank you to those that write my name in each year. I don't know who you are, but it helps me get out of the winter funk that I seem to fall into every year. It helps reassure me that while things seem tough and dismal, people are seeing my work, and liking it. So for that, thank you. This years glossy Best Of magazine hit newsstands back in May. If you live in the Nashua or Southern NH area, you might be able to find the magazine wherever you find free copies of the Hippo.